This was circulated to my group during March 2009 – nothing much has changed since and would be relevant to Asthigas still. Deeply anguished to convey a sorrowful occurrence – but before that a small intro – many of which is known to you already. For the devout, visiting temples and having darshan of God is the ultimate and for the Srivaishnavaites divyadesa yathirai is of utmost importance. For the uninitiated though there are very many beautiful temples, those temples sung by divine Azhwars in Nalayira Divyaprabandham assume special significance. Of the 108 temples where Azhwars did mangalasasanam, two are not in the material world and some are not in great shape. Centuries earlier, when transportation was not even at its nascent stage, the Saintly Azhwars went from place to place and sang hymns in praise of the Lord. In Tamilnadu, most temples (infact all revenue earning temples) are administered by the TN Govt through Hindu Religious & Charitable Endowment Board – the revenue running to the coffers of the non believers and those who speak ill of God and Hinduism. Many of us travel frequently and all buses plying from Chennai to Nagapattinam pass through Thalaichangadu which lies near to Poompuhar and Mayiladuthurai. In this otherwise nondescript village lies a small, beautiful uncared temple of Thalaichanga Nanmathiam. Sangu means shells. Once upon a time, best shells of Kaveripoompattinam were sold here. This place was also known for purasa marams. 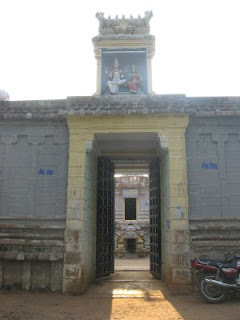 The moolavar of the sthalam is Sri Naan Madhiya Perumal. Also known as Venn Chudar Perumal in nindra thirukolam. Utsavar is Vyoma Jyothipiran also known as Venchudam piran and Loganathan. 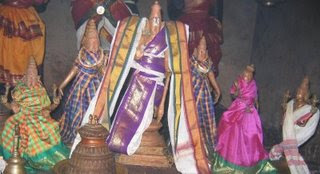 The thayar is Thalaisanga Nachiar & utsavar is Sengamalavali thayar. This is the place where chandran was liberated of his curse. This place generally wears a deserted look and the temple is situated kilo meters inside from the main road. Years back when I went to this temple this evening, we went to the house of the Bhattar who was nonagenarian and we wondered the safety of the temple and the continuance of rituals after this extra ordinary person whose commitment to the temple is unmatched. 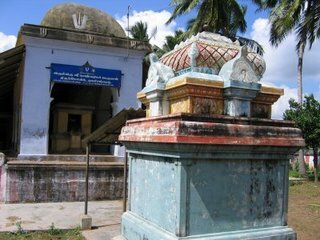 The thayar sannathi was not in good shape – for that matter the entire temple itself and it was obvious that there were not much of visitors. The Vigrahams were pristine. This is a temple sung by Thirumangai Azhwar and finds mention in Periya Thirumadal also. Here is a photo of the sannadhi inside the temple. It comes as a shock to learn that the vigrahams of the Nanmathiya Perumal and Thayar alongwith others have been stolen from the temple recently. This should shock all the Asthigas; unfortunately there has not even been an whimper. There is need for some reaction and for protecting our temples. Atleast spread the message and make everyone aware of this dreadful sin. I had shared this on e mail with my group during early March 2009 – there were reports that subsequently some idols were found in a lake near Maduranthakam and recovered by Idol Theft Wing and placed back in the temple. Understand now that the vigrahams are back in the temple but the sordid story of lack of any protection by Govt. authorities and disdain with which it was handled leaves lot to be desired. c) do something to ensure some revenue for the temple and for those who do service to perumal in such divya desams. e) Ensure that the temple is administered only by people who have faith in God and who can administer the temple without interfering with the religious practices. j) Think of Emperuman all the time and never speak ill of any bagavathas. k) Pledge that our families would remain committed to such causes all the times and vow that we will never allow any of our family members to follow any practices of other religions. l) Buy atleast some of the sampradhaya journals. Understand that running a magazine is very difficult and those who have been writing on our sampradhayam and running sampradhaya magazines are not doing it for the sake of earning money. They love to preach and spread the glorious concepts of our sampradhayam and they need to be preserved for posterity.